funny car « Big Squid RC – RC Car and Truck News, Reviews, Videos, and More! You are browsing the "funny car" tag archive. Saw this pic of the Traxxas Funny Car with a bunch of the drivers for an upcoming race today and thought I’d post it up. The vehicles are shipping soon for those waiting to get some drag racing action in! 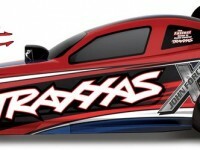 Visit the Traxxas site for a few more details.